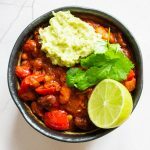 Vegan chilli sin carne (simply meaning chilli without meat) is a satisfying and easy dish to throw together. In place of meat, there’s mixed beans, peppers, onions and zesty guacamole to balance out the spices. 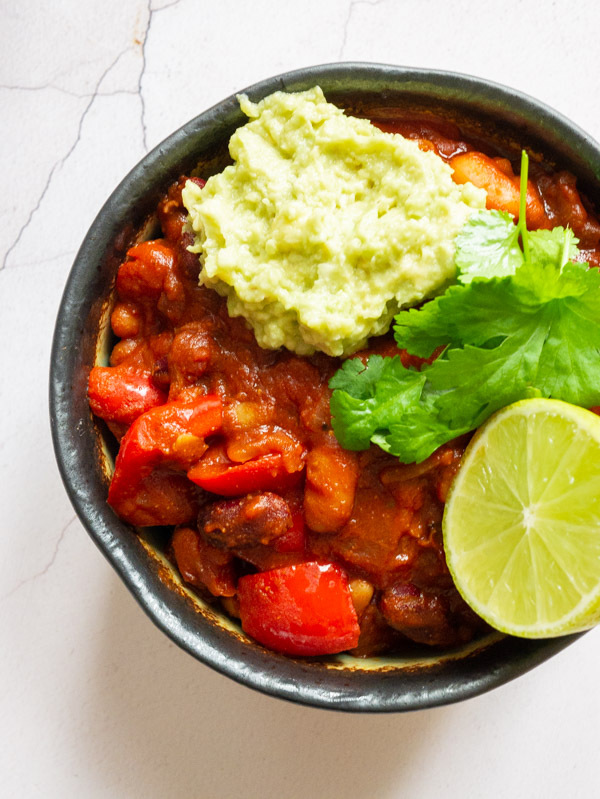 Not only is this vegan chilli full of flavour and comforting spices, but it’s also healthy and veggie-filled – seconds are essential! Allow the chilli to cool at room temperature for no more than two hours. Transfer the chilli to an air-tight Tupperware container and pop into the fridge. Consume within 3-4 days. Once cooled, transfer the chilli to a freezer-safe container and pop into the freezer. 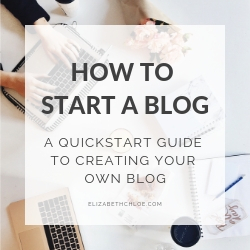 Use within 6 months. To defrost the chilli transfer it from the freezer to the fridge and leave it to thaw. This can take up to 24 hours. Alternatively, you can use the defrost setting on your microwave to thaw the chilli. Transfer the chilli to a saucepan and pop onto the stove to heat. Simmer the chilli on the stove for approximately 5 minutes, stirring regularly, until the chilli is hot throughout. You could also use the microwave to reheat the chilli. Place the chilli into a microwave safe container and heat on full power for 2-3 minutes, stirring halfway through. Ensure the chilli is piping hot all the way through before serving. If it is not, heat for a little longer. Can Chilli Sin Carne be eaten cold? Chilli can be eaten cold, however, be sure it has been stored correctly before doing so. What to serve with Chilli Sin Carne? 🍠 Baked potatoes – regular or the sweet variety. It’s cheap! You can buy tins of tomatoes and beans for pennies. 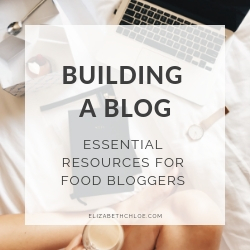 Or buy dried beans in bulk and soak them for an even cheaper meal. It is well balanced. The beans provide a good dose of protein, carbohydrates and fibre while the avocado in the guacamole is full of healthy fats. 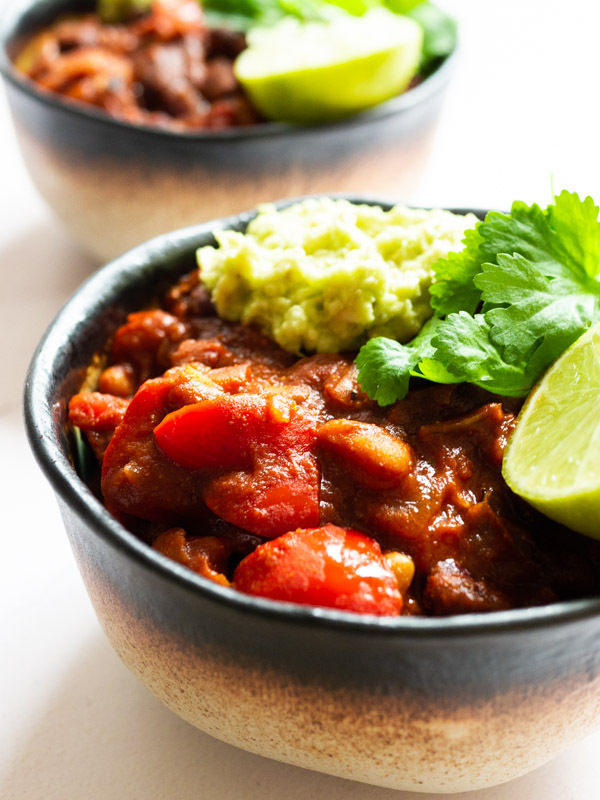 Vegan chilli is filling – that fibre, protein and fat do a great job at keeping you satiated until your next meal. No grumbly tummies! And it’s versatile! 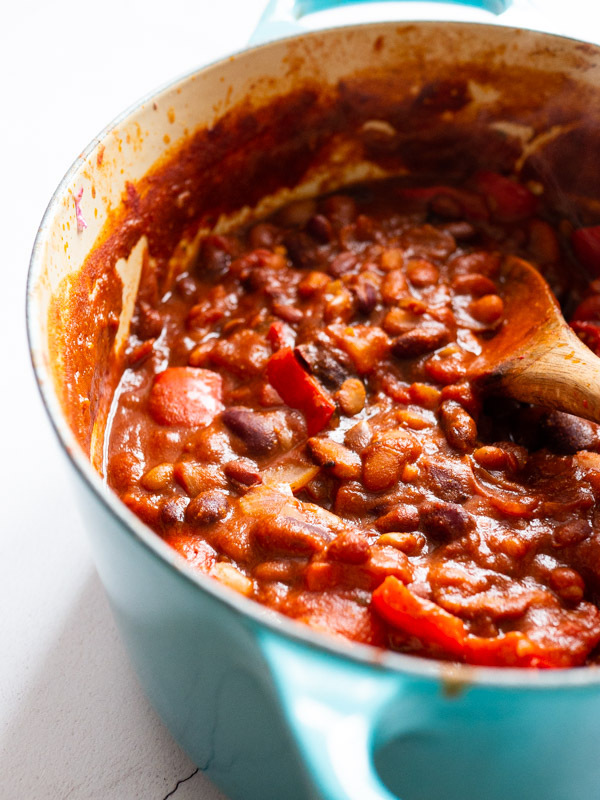 I have used this vegan chilli for all sorts of things- as a filling in enchiladas, fajitas and quesadillas, as a topping for nachos and jacket potatoes or just as it is, served with rice. 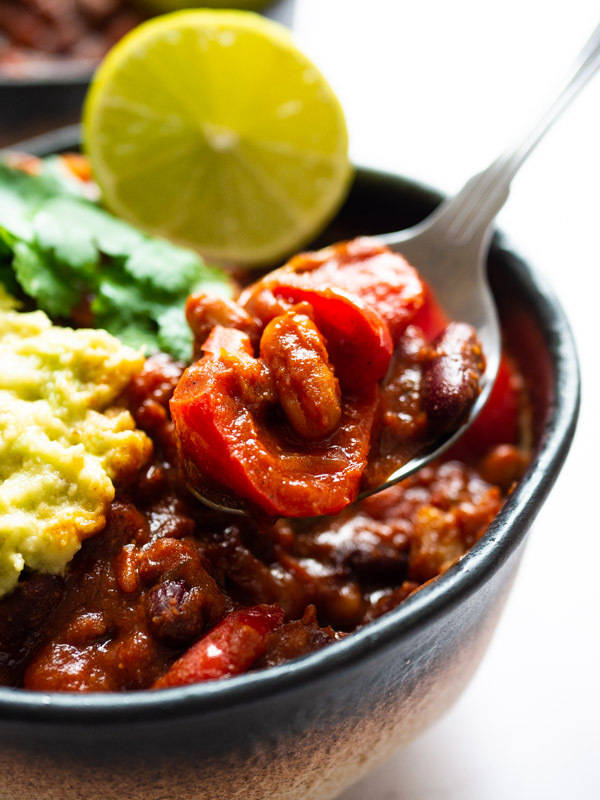 Featuring lots of beans, peppers and onions this vegan chilli sin carne is not only comforting and filling, it’but it’s also healthy too! Heat a large casserole pot to a medium heat. Add the onion and sauté for 5 minutes until translucent then add the red pepper and sauté for 5 minutes until slightly softened. Add the garlic and sauté for 1 minute. Pour in both the mixed beans and kidney beans to the pan and then add the spices. Sauté for 1 minute then add in the tomato puree. Stir into the vegetables. Add in the chopped tomatoes and vegetable stock. Stir everything together. Bring the mixture up to a boil and then down to a simmer. Leave the mixture to simmer for up to an hour, until the sauce has thickened. If the mixture becomes too dry add in extra water until it reaches your desired consistency. Taste and add salt and pepper to taste. While the chilli is simmering make the guacamole. Mash the avocado with a fork along with the garlic, lime and olive oil. Season with salt and pepper to taste. Leave aside until you are ready to serve. To serve spoon the chilli over the baked sweet potatoes or rice and add a dollop of guacamole on top.